The origins of caponata may be found in Sicily but today it is served throughout Italy, in one form or another. Yet, as varied as the final dishes might be, 5 ingredients form the basis of virtually all renditions: eggplant, tomato, onion, garlic, and olive oil, with eggplant being the star of the dish. Beyond these 5, the additional components depend as much upon the individual cook as it does the region of Italy. There’s no better example of this than Mom’s recipe and the one that Zia, her sister, follows. Both included some bell pepper and mushrooms but Mom, also, added zucchini; Zia rarely, if ever, does. The difference here is minimal but, then again, their kitchens were only separated by less than 20 vertical feet. Imagine the differences when there’s hundreds of miles separating the kitchens. In fact, I’ve seen caponata recipes that include, among other things, olives, pine nuts (pignoli), fennel, capers, currants, celery, and even seafood. Seafood seems a bit much to me and I pretty much follow Mom’s recipe. Still, more important than which recipe to follow is finding the right ingredients. Like Mom & Zia, I’ll choose only those vegetables that are fresh and “in season,” for best results. And if you end up with caponata that looks suspiciously like ratatouille, well, I won’t tell anyone. Whatever vegetables you choose to include, try to chop them evenly, creating pieces that are roughly the same size by type. I cut the “firm” vegetables — onions, peppers, etc. — into strips. 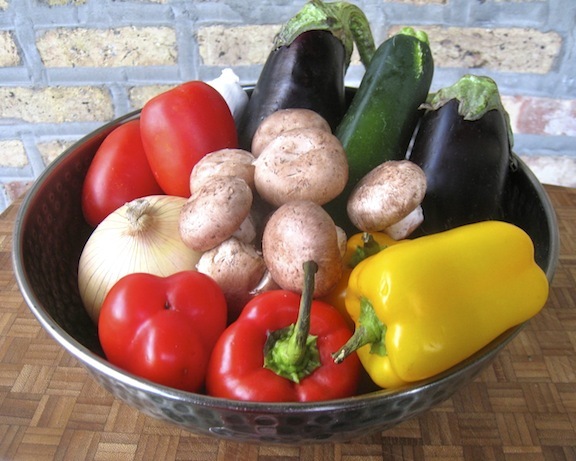 The “soft” vegetables — tomatoes, zucchini, eggplant, etc. — are chopped into 3/4 to 1 inch cubes. By cutting the ingredients into strips and cubes, you’ll be adding visual interest to the final dish. When sautéing, begin with the most firm vegetables and proceed until you’ve added the softest. The end-result should be a dish of vegetables that are fully cooked and not at all al dente. Caponata may be served hot, warm or at room temperature. It can be served as a side dish or as an appetizer, where it can be used as a spread or to make bruschetta. Like Mom before me, very often I’ll use it to dress pasta, resulting in a delicious vegetarian dish. Best of all, to my tastes, left-over caponata can be used to make a delicious frittata the next morning. In fact, when I was a boy, Mom always reserved a portion for my breakfast the following day. Today, if I go to a farmers’ market in the morning, it’s almost guaranteed that I’ll be having some form of caponata that evening. You can guess what I’ll be having for breakfast the next morning. Add oil to a large fry pan and heat over a medium-high heat. Add onion and bell pepper, season with salt & pepper, and sauté until barely soft, about 5 minutes. Add mushrooms and continue sautéing for about 5 minutes. Add eggplant, zucchini, and tomatoes, stir to combine, season with salt & pepper, and sauté until done to your liking, at least 8 minutes more. The dish is now done and may be served hot, warm, or at room temperature. As mentioned above, this basic recipe can be modified in any number of ways. Thinly sliced fennel, cubed summer squash, currants, pine nuts, celery, you name it, all may be added. Once you’ve assembled and prepared the ingredients, it’s just a matter of adding them to the pan in an order that assures each will be done to your liking. If the order that I’ve listed above doesn’t do that for you, change it to suit your palate. Left-over caponata can be served with pasta or used to make a tasty frittata. I’ll devote a later posting to our frittata recipe but, for now, I’ll share the “easy” method. For this, pre-heat your oven to 375*. In a fry pan over med-high heat, re-heat the caponata. Meanwhile, lightly scramble enough eggs to insure ample coverage of the re-heated caponata. Pour the eggs into the fry pan and, like you would with scrambled eggs, use a slotted turner or spatula to gently pull back the edge to let the eggs run behind it. After a few minutes, place the pan in the pre-heated oven and bake for about 10 minutes or until the top of the frittata is set. Top with grated cheese, if desired, and serve immediately. Coincidentally, while this recipe was waiting to be published, our local PBS station aired a re-broadcast of an episode of Jacques Pepin’s “More Fast Food My Way” during which he prepared ratatouille. 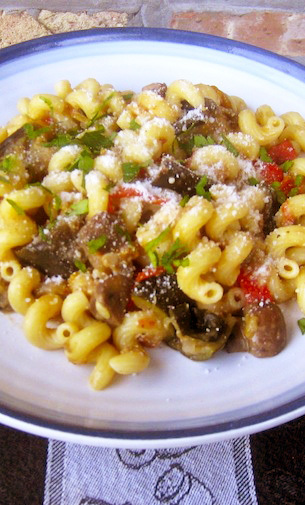 Not only did he mention how similar ratatouille was to caponata, he used it to dress some penne pasta. How about that? You can add “French chef” to the list of Mom & Zia’s many titles and accomplishments! This entry was posted in Appetizers (Antipasti), Family Recipes, Sides (Contorni), Vegetarian and tagged Cooking, Food, Italian, Recipes, Vegetables by ChgoJohn. Bookmark the permalink. 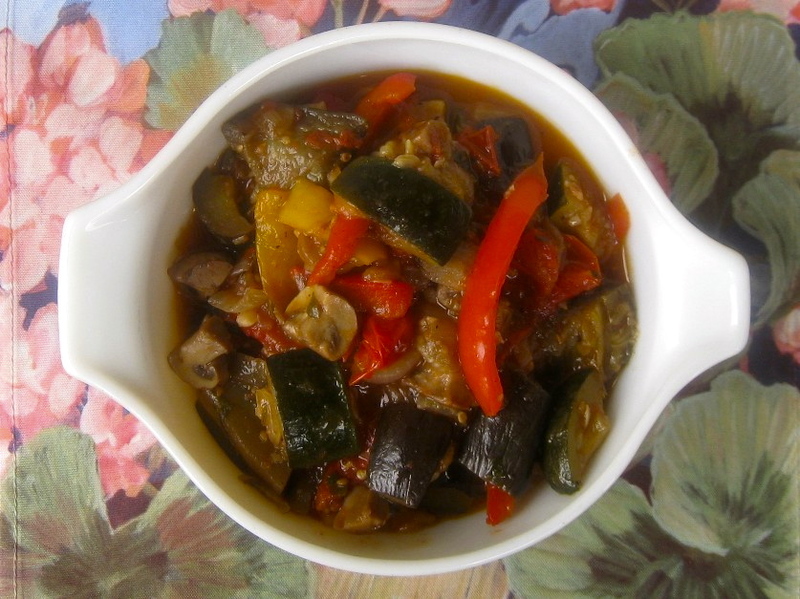 Mmm…I love ratatouille and I love caponata! My dad made a killer caponata; it’s always interesting how every family had their own recipe! (especially our sauce!) I always love having leftovers too as you suggested for adding in to so many other dishes. Great post on the history of this dish, you not only share great recipes but also provide a wealth of knowledge on the dish! Thank you, Linda, for stopping by and for being so complimentary. I love this time of year for all the caponata that I can make. And you’re so right about families and recipes. There were 5 adults that cooked and lived in the old two-flat — and each one produced a unique tomato sauce. To this day, if it were possible to have a taste test, I could name who was responsible for what sauce; they were that different. I don’t think I’ll ever figure out how they did it. I’ve never had caponata, but this looks yummy! We don’t have eggplant in our small garden – tried last year with bad results! Could you make this with just zucchini? Or substitute yellow squash for the eggplant? There is an overabundance of both! Traditionally, caponata is eggplant-based but if your cup overfloweth with zucchini, then I say go for it. How can you possibly go wrong with freshly picked vegetables from your own garden? It may not be a true caponata but it will be very good, that’s for sure. Let me know how it turns out. Good luck! I love dishes like this at room temperature. I also love using the leftovers in pasta. Hmm, we have zucchini and eggplant in the fridge… I’m putting an order in with the head cook! I’m with ya, Katherine, about both, the room temp sides and leftovers with pasta. When you place your order, make sure it’s a double. That way you’re sure to have enough left over for a great pasta dinner. I have a feeling that your cook won’t mind one bit. Adore caponata and love the info you give on it. My family´s version uses celery, fennel seeds and grated orange zest..maybe it´s a Calabrian thing?! I once drove through Calabria and I do recall oranges being grown there. So, I think you’re right about the orange zest being a Calabrian thing. I wonder if caponata from Positano and Amalfi contains lemon zest? Well, no matter how it got to your family’s table, it sounds like a winning recipe. What a wonderful bowl full of palate tickling flavours and I love the idea of turning this into a frittata too. Thank you, Mandy. Being my siblings didn’t share my love of the frittati, they became a special treat between Mom & I and those breakfasts today remain a favorite memory. You, too, Mandy, have a wonderful day. That looks absolutely delicious. Good thing I love eggplant. I should try this sometime. The photos and the directions are making me hungry! Chris, this is the time of year to make caponata. I see that you, too, are from Chicago, so, I hope you’re aware of all of the neighborhood farmers’ markets. One quick stop to any of them and you’ll have all of the ingredients you’ll need to make yourself a great dish. Looks great and I appreciate you adding an idea for use of the leftovers. Question… is it non-traditional to serve caponata with some grated/shredded parm? When served as a side or appetizer, my family never served caponata with any kind of cheese and I’ve not seen any recipes that call for it. When used to dress pasta or within a frittata, then cheese comes into play and I bet some caponata-topped bruschetta would be even better with some melted cheese on top. If you come up with some combination that works, by all means come back and tell us about it. Bravo!! I love your version of caponata, which – as you wrote – varies depending on the region. Your idea of using leftover caponata is brilliant and clever!! Thank you! I do enjoy caponata. When I travel in Italy, I make sure to have a dish of caponata in each region I visit. There are so many variations, each better than the last, and I love tasting them all. Thanks, Cam. I know your time, especially internet time, is valuable and I appreciate your spending some of it here with me. These vegetables have some shape — you can tell which is which, for example — but nothing about them is the least bit al dente. Veggies are thoroughly cooked in traditional Italian cuisine.